Lisa Galbraith Heyl lives near Lake Minnetonka in the western suburbs of Minneapolis, Minnesota. She enjoys using contemporary and vintage components, bringing an unexpected quality of timelessness to her jewelry, art baskets, and hand painted and woven sculptures. She welcomes custom and commissioned pieces. Lisa began making necklaces and bracelets in 2004. She likes to use semi-precious gemstones, pearls, wood, horn, shells, glass, cloisonné, ceramic, African and Native American beads, vermeil, sterling silver, copper, brass, vintage and man-made components and findings from all around the world. She often makes multi-strand necklaces that can be worn in single, double, or triple combinations, offering variety and flexibility when worn with different outfits. Some clients like to have a necklace and bracelet designed to wear with a particular outfit. Lisa began working with basketry and woven sculptures in the spring of 2014. She works with reed and other natural fibers for some of her woven art. She enjoys weaving colorful complex patterns. 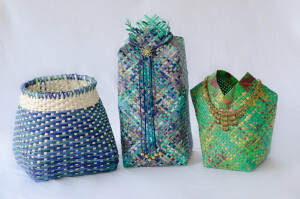 She also makes hand-painted and woven baskets and sculptures using archival paper and acrylic paints. For these pieces she uses a pasta machine to cut the paper into 1/4 inch weavers. 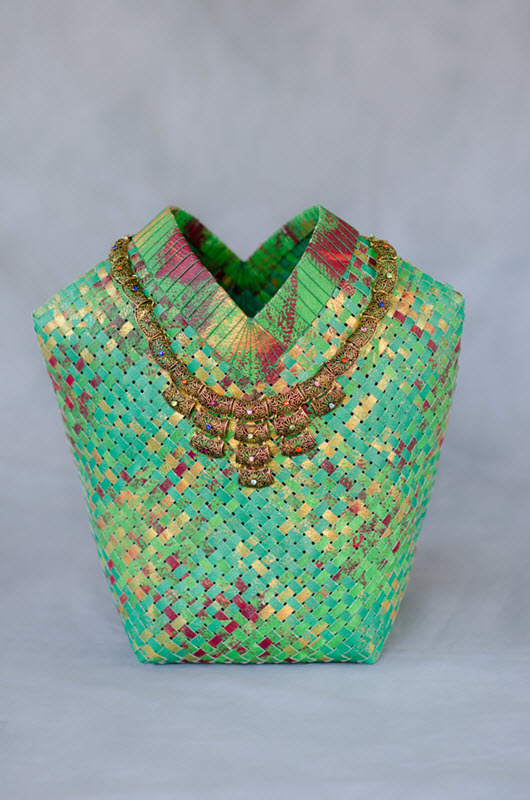 Once they are woven, she embellishes the pieces using her jewelry components or vintage jewelry pieces; some of the jewelry can even be removed and worn and then put back on the art.